The LED Strip has a total length of 196.85" ~ 5 meters , can be cut every 3.93"~ 100mm. 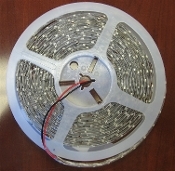 Pure White LED Strip with 60 LEDs per 39.37"~ 1 meter , 24vdc ( Waterproof ). Replace: Fluorescent tubes , Bulbs , Dicroicas lights , Emergency Light in Car Panel .